Tales from the Far East tell the captivating story of the Imperial Dragon appearing before a poor farmer’s wife who was laying sleeping beside a pond as he made his way home with the clouds darkening as lightning flashed and the sound of thunder roared out as the huge scaled dragon loomed over her, only for her to give birth a few months later to a baby boy who would go on to become Emperor Gaozu who was the first ruler of the Han dynasty. Imperial Dragon has a structure of 5 reels with 3 rows and 20 fixed paylines with stakes of 20p up to £100 per spin allowed. While the return to player percentage is average at 95.53% and there aren’t the usual number of bonus features that we have come to expect from Blueprint Gaming slots, Imperial Dragon boasts base game wins of up to 20,000x your line bet, a two-tier gamble feature where you can win cash prizes or special spins, plus the Golden Dragon Bonus feature where you’ll experience a fiery free spins mode that never fails to deliver epic wins! As you’d expect from an online slot based on the Far East, the symbols featuring on the reels are rather striking. The Imperial Dragon leads the way as the most valuable of all in a dramatic pose as flames flare in the background with this delivering up to 20,000x your line bet and it is also the Wild symbol, with the other special symbol being a golden dragon coin which is the Scatter. There is also a large dragon statue positioned outside a temple, a stunning view of the temple itself, lanterns, fans and Ace to 10 icons which are the lowest valued of all – nothing new there then! Witnessing three or more of the golden dragon Scatter symbols on the reels at once will activate the Golden Dragon Bonus feature where the number of free spins that you have won will be determined by the number of Scatters that you trigger the feature with as three reward you with 15 free spins, four earn you 20 free spins and five deliver you with a jaw-dropping 50 free spins. Throughout the free spins feature you can also collect Scatter symbols to access bonus reels which have different perks depending on how many Scatters you manage to accumulate. Twelve Scatters will see the second reel transformed into a Stacked Wild, 18 Scatters and an Expanding Wild will take command of the third reel while the Queen, Jack and 10 icons will be removed from the reels, while 24 Scatter symbols sees even more Expanding Wilds on the reels with all playing card icons removed to ensure it’s only high-valued winning combinations you’ll be experiencing! Below the reels, you’ll notice that there is a gamble button which can be set to ‘gamble off’, ‘gamble 1x total bet’ or ‘gamble 5x total bet’ with this being a great way to show the dragon just how brave you are by risking your winnings to win even more. If you opt to turn the gamble feature off you simply won’t be offered the choice to gamble after winning combinations, however if you have it set to ‘1x total bet’ you will be offered the choice for wins worth more than 1x your stake and the same applies for the ‘5x total bet’ option. Once a large enough win occurs and you decide to gamble you will be taken to a gamble ladder where you can win cash prizes or Imperial Spins (up to 100), but be careful as you could lose and see the dragon gobble them up instead! 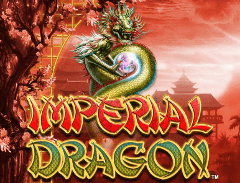 Slots based on dragons are always dramatic with striking symbols and fiery action on the reels and Imperial Dragon from Blueprint Gaming is certainly no exception. It may not boast the variety of features we normally see from their titles but the gamble feature and the incredible Golden Dragon Bonus feature more than make up for this – especially if you collect lots of Scatter symbols!